and space. Martin’s work with institutions such as the MIT Media Lab, Autodesk and New York University’s Tisch School of the Arts denote her ongoing inquiry into new models and technologies that are transforming the way art is made and consumed. Eschewing traditional art world norms, Martin’s work purposefully bridges fine art, performance art, technology and commercial work. Her artwork has appeared in the Brooklyn Museum, Museum of the Contemporary African Diaspora, Bata Show Museum and at the prestigious Albright Knox Gallery in Buffalo, New York. Shantell: Unless I have a project going on it's pretty chilled. I’ll wake up, have breakfast, go to the gym, check emails and then go out for the day for meetings or to the studio. If I have a project – for example this massive 8,000 square feet mural I just did in Denver – I’ll wake up, head to the site and draw for hours, just taking a break for lunch and dinner. 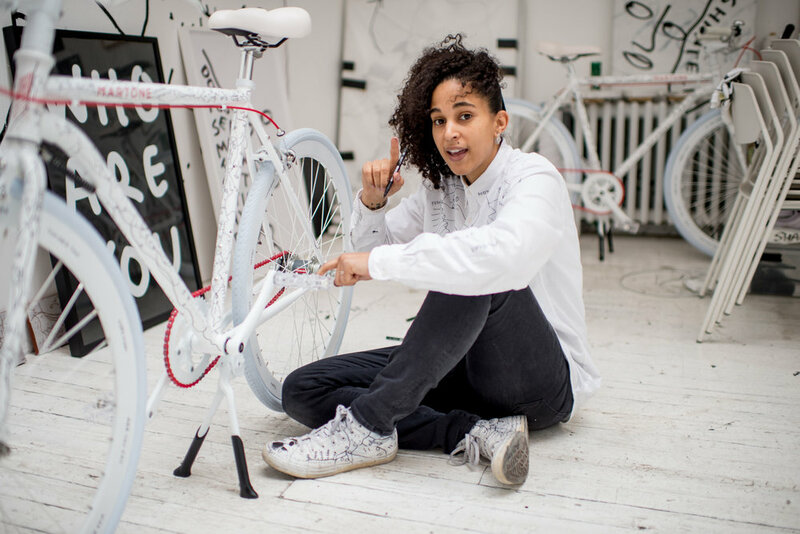 Shantell: The above, a video with my friend Casey Neistat, a solo museum show at the Albright Knox in Buffalo, a solo gallery show at the Chandran Gallery in San Francisco and launched a line of sunglasses with Max Mara. Shantell: To live a life that revolved around saying yes to things that felt like a yes and no to things that felt like a no… I was saying now for a real longtime! Shantell: There is no model for what I’m doing or have done. As an artist, I’ve had a career as a VJ, been a fellow at Columbia, a visiting scholar at MIT media Lab, an adjunct professor for years at NYU, TISH, have had solo museum shows, worked with large brands and agencies, worked a lot with nonprofits and charity’s, taught workshops with children, teenagers and adults, experimented with new mediums and technologies and I am now getting into acting and hoping to be a future correspondent. Shantell: Don’t stress. It always seems strange to me when I see friends who are crazy stressed working 60, 70, 80 hours a week and don’t feel like they are getting anything done. You must sleep well, eat well and focus during work hours and then check out and relax when not working. Shantell: Being able to imagine a future for myself that the system I grew up in did not care to imagine for me. Shantell: Hey, I wish I could see myself next week. I’ve heard it’s a good exercise, I’ll give it a go sometime. Shantell: You have to create your own opportunities by using what you have access too! Shantell: BIG fan of Saraghina in Brooklyn as I drew all over it. Drawing aside, I love to eat at NIX near union square – great staff and all amazing veggie or vegan food! Shantell: Don’t think I have one – would not want to lose my passport as they could be a pain in the side to replace. Also, I only have one photo of my Dad who I’ve never met and don’t actually know if he is still alive. Shantell: I enjoy following Maria Popova, Adam J. Kurtz, Zach Lieberman and Jessica Rosenkrantz. Shantell: Have to think about this one. Shantell: Always enjoy visiting Toronto – Just went there for my birthday. Such a chilled city, great food, museums, friends and more. Shantell: Not a huge fan of being out in water. Shantell: I'd love to know!